The Adult Self-Report (ASR) and Adult Behavior Checklist (ABCL) incorporate many items of the 1997 editions of the Young Adult Forms (YASR & YABCL), plus items and national norms that span ages 18-59. The profiles for scoring the ASR and ABCL include normed scales for adaptive functioning, Personal Strengths, empirically based syndromes, substance use, Internalizing, Externalizing, and Total Problems. In addition, the ASR and ABCL profiles feature DSM-oriented scales consisting of items that experts from many cultures identified as being very consistent with DSM-5 categories. The profiles also include a Critical Items scale consisting of items of particular concern to clinicians. The profiles display scale scores in relation to norms for each gender at ages 18-35 and 36-59, based on national probability samples. Adults complete the ASR to report their own adaptive functioning, problems, and substance use. People who know the adult complete the parallel ABCL. Both forms are valuable for assessing adults in mental health, family therapy, forensic, counseling, medical, substance abuse, and other settings. The ASR and ABCL are especially valuable for assessing parents of children seen for mental health and family therapy services. By having parents complete ASRs to describe themselves and ABCLs to describe their partner, you obtain profiles that highlight crucial agreements and disagreements between parents’ self-descriptions and other people’s descriptions of their functioning. You can also compare parents’ ASR and ABCL profiles with their children’s ASEBA profiles. 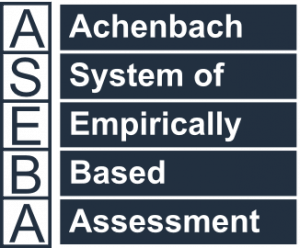 The MMO/18-59 enables you to display individuals’ ASR and ABCL scores in relation to your choice of norms for societies with relatively low scores (“Group 1”), medium scores (“Group 2”), or high scores (“Group 3”). You can also display scale scores in relation to U.S. norms. Multicultural norm options are available for adaptive functioning, personal strengths, syndromes, DSM-oriented scales, Internalizing, Externalizing, and Total Problems. Multicultural norm options are also available for the Obsessive-Compulsive Problems (OCP) and Sluggish Cognitive Tempo (SCT) scales that were added in 2015. You can choose the multicultural norms most appropriate for ASRs completed by clients who are being assessed and for ABCLs completed by collaterals to assess the clients. If you think that more than one multicultural norm group may be relevant to evaluating ASR or ABCL scores, you can display results in relation to each relevant norm group. The Multicultural Supplement to the Manual for the ASEBA Adult Forms & Profiles details the construction of multicultural norms, plus the OCP and SCT scales that were added in 2015. Using data from the societies included in the multicultural norm groups, the Supplement reports confirmatory factor analyses that support multicultural applications of the ASR and ABCL syndromes, plus internal consistencies and cross-informant correlations of scales for ages 18-59. The Supplement also illustrates practical applications of multicultural norms to cross-informant comparisons of scores obtained from the ASR and ABCL. It provides guidelines for research use of the ASR and ABCL, as well as extensive reviews of studies that report findings in many societies. As described below, the Supplement details the development and use of the Multicultural Family Assessment Module (MFAM). The MFAM enables you to enter and compare data from the CBCL/6-18, TRF, YSR, ASR, and ABCL. This is especially valuable for family-oriented approaches to working with children and parents. Bar graphs display side-by-side comparisons of scores on 7 syndromes and 4 DSM-oriented scales that have counterparts for ages 6-18 and 18-59. The bars are normed by age, gender, type of informant, and society. If users deem it appropriate, they can show parents the bar graphs to help them understand variations among reports by different informants regarding their child’s functioning and their own functioning. The bar graphs also enable parents to see similarities and differences between what is reported for their child and for themselves. This can strengthen therapeutic alliances with parents to change their own behavior as well as their child’s. Substance Use Scales: Tobacco, Alcohol, Drugs, mean substance use.